This is my virgin post of blogspot and hopefully, I can give you a sense of what I have been up to the past 22 years in the sports of triathlon. I am one of the old guard. I am 54, have raced all kinds of distances from sprints to Ironman distance and still think I can grow in this sport. Its given alot to me. I have met tons of excellent, exciting people who motivate me and give this old guy a time or attitude to shoot for. I have been blessed to have had enough influence so that colleagues of mine have tried races, but most personal to me, however, is that my son, who only got going on his fitness trail about a year and a half ago, is now racing with me and of course is kicking my fanny. Thats okay. I love it. I just finished a 6 race year. 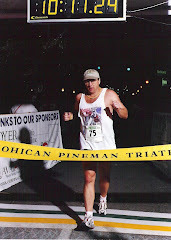 The toughest race was the West Virginia Half Iron the Mountaineer in Morgantown. I am atypical of triathletes. I usually race at around 190 pounds. When I have been svelte, that has meant being in the low 180's. I have a linebackers body in a sport for wide receivers... However, I usually enter in age group and have, on a few occasions, placed in my age group. I am in a little rut. I need to jump start my training and focus on new goals. Any help anyone can send my way, would be very much appreciated. 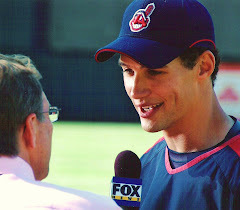 I am a Cleveland, Ohio native and a long time member of the sports media.... Being a long time endurance athlete gives me an idea as to the commitment many of the athletes that I cover have to make in order to be at the top of their games. Please give me feedback. I have ready many posts from area and national triathlete bloggers and enjoy lots of them. I hope you will stop by as time warrants. I couldn't get to Yankee stadium or Fenway, but I took your advice and got into the Jake this evening. My first playoff game. Wahoooo!